Postgraduate course in Political Economy for Master students or junior professionals, in partnership with Georgetown University in Washington DC. This program seeks Master students or junior professionals with a degree in economics, political science or statistics (but also in other disciplines - such as maths, management or finance), with strong academic background, the intellectual curiosity and discipline that are necessary to succeed in a very demanding environment and willing to take up global political and economic challenges. By the end of this Advanced Master, you will be able to gain a firm understanding of the incentives and behavior of economic (consumers, firms) and political agents (legislatures, government agencies, judicial institutions, NGOs, activist groups, the media), explore the technological and political constraints that shape government interventions, cultivate a deep understanding of the reciprocal relationship between politics and markets and design better government regulations by the investigation of corporate stakeholders and their motivations. 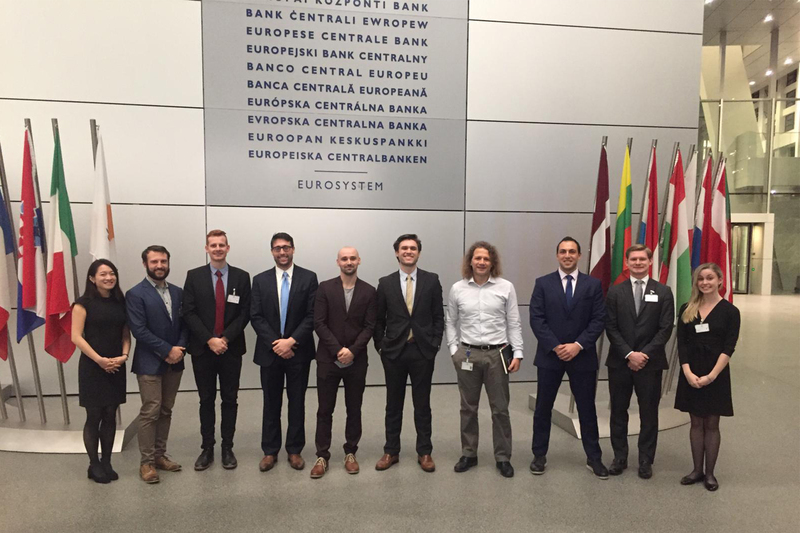 The Brussels-Washington joint degree in Political Economy is an innovative one-year program combining the strengths of two internationally-renowned institutions. Learn from expert decision-makers in Europe and North-America and explore the specificities and differences between the approaches taken on each continent, their impact in various geopolitically crucial regions around the world and the complex relationships with other actors within this global governance architecture. Every year, we organise for the students of the Advanced Master in Political Economy on-site meetings that guide students through the inner-workings of international institutions, both in Europe and the US, such as at the European Commission, the World Bank, the OECD, the IMF and various think tanks. Develop strong new competencies and acquire a toolbox which will help you rigorously analyze both the economics and the politics behind the key policy questions of the 21st century. Develop your soft skills and become more prepared and self-confident to face recruiters. Experience our teaching methods which are very hands-on and participant-centred. Courses are mainly structured into real case studies, assignments, essays, simulations, company visits and on-the-job learning. Classes are limited to small cohorts (max 30 students), ensuring maximum participation and easy access to the faculty and the advanced masters academic or administration team. The faculty comprises Solvay, Georgetown and ULB professors bringing in their theoretical insight and the latest research expertise from their respective fields, as well as top-level practitioners and regulators shaping the evolution of economic policies around the world, driven by a real passion for education bringing in their practical insight and on-the-field experience. Top-of-the-line guests are also invited for additional workshops or sessions. Diversity in class in terms of gender, academic background and culture enhances your student experience. Benefit from an international experience at the heart of global policy-making decision powers, with full immersion in both Washington DC, host of all US institutions and Brussels, capital of Europe and host of all European institutions. Become part of one of the largest business networks in Belgium (Solvay Alumni), members of which are actually present in more than 65 countries around the world and access the wide and active alumni network of Georgetown University as well. Participate in the events organized, expand your network and never stop learning and evolving. The Advanced Master in Political Economy aims at providing you the knowledge and the skills needed to evaluate and address global and local economic challenges, which require a solid understanding of the institutions and political settings in which they arise. 5- Receive feedback on your admission. If positive, please note that you will have two weeks to finalize your registration by paying a deposit of $2000. Minimum GPA 3.0 on 4.0 (U.S.) scale where available. TOEFL score of at least 100 IELTS score (7.0) is also acceptable. The test is waived if a previous degree has been obtained at an English-speaking university. The program taught me a new way to think about the intersection of public policy and economics. It forced me to dive deeper into the intersection of the two and changed my understanding of how, and often times why, certain policy decisions are made. It was an all around amazing experience and has helped me excel in my career. I wouldn’t have been able to obtain this job without this masters. Of course, the data analysis skills and understanding of micro/macroeconomics are directly relevant to my position. But perhaps more importantly, I think the uniqueness of this degree really set me apart as an applicant. In studying a diverse curriculum taught by numerous brilliant professors from two world-class institutions, I had the opportunity to study under a number of circumstances. By gaining such a wide range of experiences in just twelve months, I am now more adaptable to different environments. The economy is increasingly globalised. Our Advanced Master is a unique offer for those who want to think beyond borders. Merit-Based Mobility Scholarships for EU students: EU candidates applying before ​April 16th​,​ 2019 can ​apply for ​one of two 2 ​mobility ​scholarships​, worth 10.000$ each. which will bepresented side by side. Both documents will reference both degrees and will include the name of the other institution.